WITH GLOWING HEART I'D PRAISE THEE. 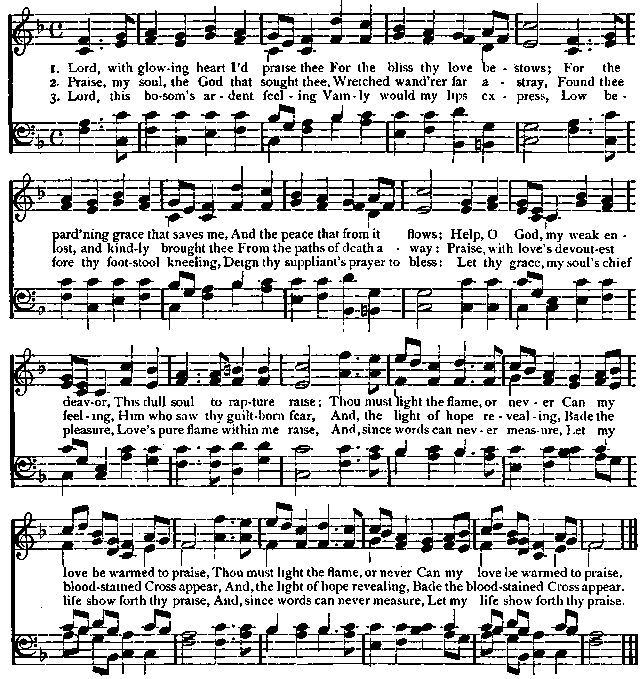 "Austrian Hymn," Francis Scott Key, 1826.
veloped by a praise-meeting yield substantial results in the conversion of sinners and the strengthening of saints. There is no doubt that singing, especially the singing of a well-trained congregation, is quite as legitimate and possibly as effective a means of grace as praying or preaching. The voice of the great congregation is one of power. You can sing men into the kingdom as well as pray them in. But true Christian praise will ever contemplate religious ends. It will never degenerate into mere recreation." "Cheerfulness," says Bishop Taylor, "and a festival spirit fill the soul full of harmony; it com�poses music for churches and hearts; it makes and publishes glorifications of God; it produces thankful�ness, and serves the end of charity; and, when the oil of gladness runs over, it makes tall and bright emis�sions of light, and holy fires reaching up to a cloud and making joy round about. Since it is so full of holy advantage, whatsoever can innocently minister to this holy joy sets forward the work of religion."